Students usually have the most fun in my Laboratory Procedures class when they are actually in lab participating in hand’s on activities. Lecture, while exciting to me, isn’t always their favorite. So what could I do to spice up my lecture time? Bring lab into lecture by flipping my classroom!Lab Procedures 2 can be a little overwhelming for students. We are working in multiple learning plans collecting blood samples and running tests. Sometimes it can be easy for students overlook important details or to struggle with learning those concepts. 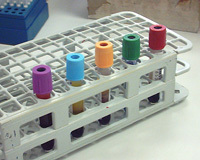 One example is learning the tube colors, additives, order of draw, common tests, and lab departments for phlebotomy. We cover the materials in class during lecture, handle the tubes during lab, and complete a tube chart, but it doesn’t seem to be enough. So I thought I’d switch things up a little bit and flip this portion of my instruction. As mentioned above, each student must complete a tube chart as one of their required assignments. All information to complete the chart is covered in lecture and can be found in their textbooks. A quick Camtasia video took care of the need to lecture on this topic and a change to the course calendar due dates required that the tube chart be completed prior to scheduled lecture that week. When students showed up for lecture, they were greeted with a bag full of empty tubes and note cards displaying the different departments of the lab. The students were then given scenarios and had to determine which tubes they would draw, in what order, and what department the tube would go to. Students were advised to do the best they could without help, but could go to their completed tube chart if needed. This flipped classroom activity was fun. It made learning this information much easier as the students were able to put it into use right away. And, it brought the lab into lecture! Where do I stand in line?